BD's classic design for injection comfort, the BD Ultra-Fine™ IV Needle is a 30-gauge, 12.7mm (1/2") syringe needle that has been trusted for years by people with diabetes. To ensure maximum safety and comfort, you should never use a syringe more than once. For more details, read about the risks of needle reuse here. All BD syringes come coated with special Micro-Bonded lubrication for a more comfortable injection. Syringes are manufactured with a special surgical grade of stainless steel. 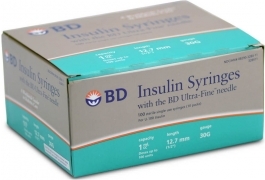 BD Syringes are subject to 100% needle point inspection to assure consistent high quality. For help with your product, please call the BD Customer Service Help Line at 1-888-BDCARES (1-888-232-2737), Monday - Friday, 8:00 am - 8:00 pm, Eastern Time. You can also reach BD Customer Service with customer feedback at https://forms.bd.com/diabetes/pc209/index.sp.